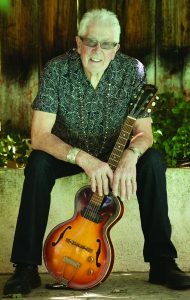 IF BLUES artists get better with age, John Mayall must be starting to reach his peak. The leader of The Bluesbreakers who is known as the ‘Godfather of British blues’ has just released his 65th (yes that’s 65!) studio album called Talk About That. What’s more, having worked with everyone from Eric Clapton and Peter Green to Mick Taylor and Chris Rea, this time he collaborates with Eagles’ guitar legend Joe Walsh. Unbelievably, he says the only thing holding back recording is his inability to read musical notes. “Because I can’t read or write music I don’t finish songs until we’ve got some studio time,” he explains. “I put material together about a week before we go into the studio. There have been around 50 members of The Bluesbreakers since the early ‘60s, including Walter Trout, Mick Fleetwood and Jack Bruce as well as Clapton and Green. He’s also known for loving collaborations and in 2001 recorded Along For The Ride featuring assorted ex-Bluesbreakers along with Gary Moore, Johnny Lang, Jeff Healey, Steve Miller, Otis Rush and Chris Rea among others. “Sometimes I hear a musician and it clicks as somebody I want to work with,” he says. “Being a band leader you get the privilege of working with all you want. The latest hook-up, with Walsh, he says “came out of the woodwork”. “I didn’t know anything about his interest in me, but I think the album is pretty special. “He just showed up at the studio on the second day. He was in the studio for maybe three hours and they’re all one-takes. It was very pleasurable. Macclesfield-born Mayall has lived in America since the late 1960s but has been looking forward to his current British tour. “I’ve been in the States more than half my life, this is home to me now – but it’s very nice being a musician and getting to travel the world,” he says. “I often do a big British tour and it’s great to visit all the places I’m familiar with and have an English audience appreciate what I do.